(Newser) – Lola Ogunyemi grew up being told she was pretty ... "for a dark-skinned girl." So when Dove offered her the chance to model in one of its body wash campaigns, she jumped at it. "Having the opportunity to represent my dark-skinned sisters in a global beauty brand felt like the perfect way for me to remind the world that we are here, we are beautiful, and more importantly, we are valued," she writes in the Guardian. Unfortunately, soon after the ad debuted, Ogunyemi discovered she "had become the unwitting poster child for racist advertising." 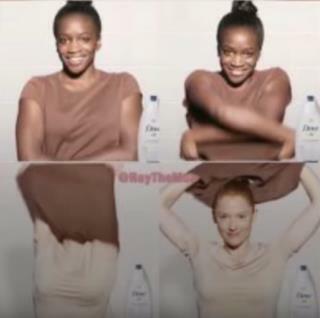 In the ad, which Dove pulled after it was posted online to massive backlash, Ogunyemi is shown removing a brown shirt ... to reveal another model in the next clip, this one white and wearing a lighter shirt. "If I had even the slightest inclination that I would be portrayed as inferior, or as the 'before' in a before and after shot, I would have been the first to say an emphatic 'no,'" she writes. By Protesting Racial issues.. ARE Blacks NOT actually admitting and accepting the role as the subordinate Race.. They can say.. I am rubber and you are GLUE,, What ever you say, bounces of me and sticks to YOU.. "I Don't care what you say or Think" But instead they choose to say. I really am the person describe by YOU, and I am mad as H311 that you remind me that it is TRUE.. "Stop saying or implying that because it pisses me off"
I thought it a great ad. I'm of mixed races, I guess I should be upset that there weren't any freckled middle colored skin tone people? I wish there was a product on the market that could cleanse and remove all of those distorted political correctness idiots that further cause hate and dissention amongst all peoples' skin color, gender, religion, obesity or whatever?